The Ramayana is probably one of the most famous epics in the world, with its universal themes of love and loss, good triumphing over evil, and the journeys you must sometimes make to discover who you are. It brims with compelling characters and conjures up this fantastic world where great extremes - myth and reality, mortal and immortal, human and animal- could not just coexist but also collaborate. Author Harini Gopalswami Srinivasan sets her entertaining story square in these magical times. Her hero, Gind, a young vanara, is your average teenaged simian, lounging around in the fruit trees of Poompuhar and dreaming of a place of his own, away from his enormous family. A youth in need of adventure, you might say, and you would be right. For splat in the middle of that ordinary day, he encounters the great sage Agasthya, and is entrusted with the care of Ongchu, a young vanara girl he has just rescued from a rakshasan (demon). "Oi shpeak the oncient tongue of the vonorosh", says little Ongchu, who has endured captivity and long months away from her father, and must now journey back to him in the kingdom of Baulpur, beyond the Himalayas. "Whosh yosh name?" Gind chips in and, several cups of kashayam (a herbal brew that is part of the staple pan-Indian vanara diet)later, the duo is off on their journey across the length of India,accompanied by Gind's father, Karuppan. Between encounters with hungry two-headed rakshasas,quirky gandharvas and kashayam-drinking yetis, they find their lives intersecting with an adventure far greater than their own - a collaboration between the human and animal world to free a princess held captive by rakshasas on a distant island. Through scraps of stories they hear on the way, and from sightings of people like prince Bharat and Hanuman (whom the trio resuscitates midway in his quest for the Sanjeevani herb), the characters follow the progression of that epic story, even as they head toward the conclusion of their own. In a hilarious subplot , Indra, lord of Devalokam (the abode of the Gods) deals with an existential crisis all his own. It's bad enough that he finds himself upstaged by Vishnu, reincarnated as prince Rama on earth and hogging all the limelight with his quest for his beautiful wife Sita. And it's even worse that the entire animal world seems intent on helping Rama build a glorious bridge across the ocean to the distant island where Sita pines for him. Yet Indra has worries even greater - in a parking disaster of sorts, he has disturbed the mighty - and very temperamental - sage Agasthaya's penance and is now saddled with a curse he cannot quite understand. So between bouts of suspecting his faithful mount Airavath of treachery, and planning a bridge of his own to rival Vishnu/ Rama's, he sets out to decipher this curse before it destroys him. It is only a matter of time before he encounters Gind and gang, in a face off where sparks will fly, as will witty banter. 'Gind' is great fun to read, replete with action and much slapstick. 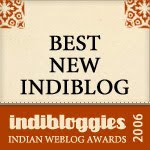 Harini Srinivasan excels in the humorous scenes; I could almost imagine her, tongue in cheek and eye atwinkle, as she scripted the sections where Indra has a tantrum, Chitratha painfully tutors a tone-deaf Airavath in music, or the rakshasan Bomman terrorizes the travelers, before getting his comeuppance. These are the scenes that make this book. She is also good with verse and, as with her first book, 'The Smile of Vanuvati',small snatches of poetry liven up 'Gind's' narrative. I related strongly to the essential Tamizhness of the book .All the main characters speak Chentamizh, sport decidedly Dravidan names like Thenmozhi, Karuppan and Bomman, and a lot of Tamizh words feature in the book (kashayam, pollam, alamaram, and that lovely invention - the payasapazham, suggesting a fruit as sweet as that much loved sweet, payasam). But more than that, the way the narrative unfolds, alternating between Bhoolokam (the mortal world)and Devalokam with a strategic "Meanwhile.." , and the irreverent descriptions of such hallowed figures as Agasthya and Indra, reminded me of my own grandmother's rambling, and wildly funny story telling sessions, always in her impeccable Tamil . The author also refrains from using the names of most of the Ramayana characters that appear in this book, so the relevance of certain scenes may be lost on readers unfamiliar with the epic. However, she does add a helpful summary of the Ramayana at the end of the book which helps the reader join the dots. The Imp loved this book though she did roll her eyes over Gind's budding romance with the lissome Thamarai, a vanara he meets on his journey. I enjoyed it too - great idea, interesting characters, and an exciting proximity to an epic adventure. And the resolution of the mystery of Agasthya's curse was interesting, giving us yet another memorable character to enjoy, and elevating a certain formerly nasty character to hero status. However, this is a book that begged to be longer - surely a journey that spans the length of India would throw up more adventures than the odd bumbling rakshasa or wild beast encounter. And how come there are no more strangely accented versions of vanara-speak to grapple with? Also, in the midst of such well crafted characters as Indra, Chitratha, Bomman and even heroic Karuppan, our hero Gind appears insubstantial and gets to do very little besides go weak in the knees over a girl. I also think the story could have made stronger connections with the Ramayana besides a brief encounter with Hanuman,or the odd sighting of Sita and Bharat. As it stands, beyond instances like these, the trio's trajectory stays firmly parallel to the Ramayana's, and left me a little dissatisfied, especially since both had enough in common ( A kidnapped princess. A gigantic odyssey. Rakshasas. Talking monkeys!) to make for some interesting situations. Nonetheless, I liked the idea behind the book, its inventive characters and sparkling humour, and the Imp especially enjoyed trying to identify the little bits of the Ramayana she encountered as we read through the book together. Hats off to the innovative storytelling and concept! Sounds like a riot..very curious to read it for myself. Great find WJ. Wow! What fun!!! This is so going in my list (non-existant until now!). Sounds like a great laugh and a good time! Thanks WJ, for that spotless review! How innovative, WJ, thanks for an excellent pick. I got a kick out of this little detail: "...Hanuman (whom the trio resuscitates midway in his quest for the Sanjeevani herb)"! No sacrosanct reverence, just inventive weaving of myth/legend and a good adventure. I have had this book on my bookshelf since a few months now, gifted by a friend to A. Somehow never got around to reading it, although we have read 'Smile of Vanuvati' by the same writer. Goes immediately on my to-read list for post CROCUS. Now could we request the writer to give us a similar adventure story set in the times of the Mahabharatha? That will be so wonderful. are portrayed with human emotions! I love the tamizhness(if there a word for like that) of this book. And Kashayam drink - oh my god. Yuck! WJ - A great review. What a lovely review! It's a really funny book and we at Puffin had great fun with it. Forwarding the link to Harini now. And thanks Sandhya for that thumbs up for Puffin! That should be thanks artnavy! WJ ~ A sparkling review. Enjoyed every word that you've selected to describe the book. Reading this post was a treat in itself. Awesome review WJ. Have seen this book but somehow never picked it - dont know why. Will certainly do now. Hilarious!!!!! It must have been difficult to write about a book as brilliant as this, without going overboard on superlatives, while conveying the humor and not giving away too much. Love it! Both the idea of this book and your review. Echo utbt. Thanks to you, wordjunkie, I want this book *now*!!! Glad you all liked the review. The book is quite a riot. And it will have atleast some of you speaking the ancient vanara tongue for a while ... the Imp and I are still at it. I've seen this book...now it looks like I have to pick it up, after your review!!! An impeccable review. Sounds like a modern myth in the making that is not superficial, but deep-seated and firmly established in its own imaginative storytelling, despite the tad bit of piggybacking on the ancient! Why not? Our children need more such inventive stories with hybrid compositions, don't they? :) Thanks WJ and thank you, Harini! Saffron Tree is an absolute delight this week, I can't wait to get to my PC every morning to see what new things have been added. I'm so thrilled to be part of Crocus! I do hope the book will not disappoint utbtkids and poppins, and all the others who plan to read it. Thanks everyone, and an especial thanks to Wordjunkie for such a great review! Wj, the first thing that struck me after reading this review is that it is so professional. In the sense I feel that you have done an indepth analysis of the book covering various angles. I am so impressed ! After reading Wordjunkie's review, I was waiting to lay my hands on this book and I did few weeks back. The book was every ounce satisfying as I expected. But what I didn't expect was my first born child to totally hijack the book from me! The past few weeks, she has read it and re-read it M.A.N.Y times. Thanks Harini for such a satisfying book - for both mother and daughter.